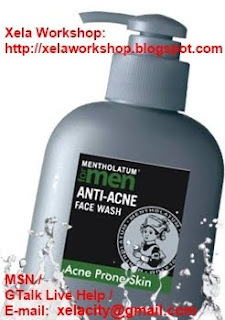 MENTHOLATUM for men ANTI-ACNE Face Wash contains Tea Tree extract, effectively regulate oil secretion and prevent pore blockage, keeping skin refreshed and healthy. It can deeply cleanses your skin and washes away dirt and prevent blemishes. It also has hazel and olive oil extract that moisturize and soothe skin, while refining skin pores and leaving your skin non-greasy. MENTHOLATUM 男士草本控油潔面乳 蘊含天然茶樹油，幫助調節皮膚油脂分泌，防止毛孔塞，有效預防青春痘；深層潔淨皮膚，去除多餘油脂和污垢 蘊含天然金縷梅精華及橄欖油，有效舒緩、保濕及收細毛 孔，更能從皮膚內部阻止青春痘的産生； 清爽不油膩.